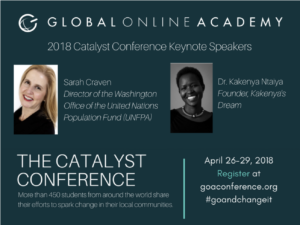 Dr. Ntaiya founded Kakenya’s Dream, an organization devoted to supporting and educating girls and young women in rural communities in Africa. Through the development of programs, partnerships, and schools, the organization strives to put an end to harmful traditional practices and empower the women it serves to bring about change in their communities. Watch a short film of Kakenya’s story below or view her TEDTalk from 2012. Ms. Craven is a graduate of GOA member school Punahou School and is currently serving as the Director of the Washington Office of the United Nations Population Fund (UNFPA). She is a policy advocate and attorney with expertise in women’s reproductive health and rights. Ms. Craven’s work advocating for rights-based population policies has included positions at the U.S. Department of State and the Centre for Development and Population Activities (CEDPA). Prior to her work at CEDPA, Ms. Craven was a staff attorney at the National Women’s Law Center and served on the legislative staff to Senator Timothy E. Wirth (D-CO) and Senator Spark Matsunaga (D-HI)” (source). Ms. Craven’s work has intersected with Dr. Ntaiya’s work and the two have collaborated for some time. The two speakers will use questions generated by students to guide their conversation. They plan to discuss their individual and shared work, share successes and challenges of navigating the world of social change, and offer words of encouragement and advice to the young advocates and changemakers presenting and attending the conference. Return to this page on April 26 to view their conversation. GOA asked recipients of last year’s Catalyst for Change Prize to address students and share what impact Catalyst Project had on them. We’re thrilled to share messages from Anthea Lovett ’17, Hong Kong International School alum, who took GOA’s Music Theory and Digital Composition course, Louise Hatcher ’17, Westminster Schools alum, who took GOA’s Architecture course, and Kailtyn Paulsen ’18, Lakeside School, who took GOA’s Game Theory course.